I’m finally catching up on all my personal sewing. It’s taken a while. And by a while, I mean about eight months since this fabric was cut out and ready to sew. But finished is finished, and I’m really happy with how it turned out! Yes! I had a difficult time choosing fabric for this style. I wanted something with a little body and structure, but I didn’t want it to be too dressy. (I want to wear the top casually, which is generally my style.) I loved the raw silk, but because it’s a very nubby fabric I knew it would also need a lining, and the pattern isn’t written for a lining. But now that it’s finished, I love the fabric and am very happy I lined it. Only the addition of the lining. And I think I added a couple of inches in length, which I usually do, but those are the only changes I made. I’d love to tell you how I went about lining it, but dealing with the zipper and zipper facing got a little tricky so I think it’s best to say that I did some hand sewing and a few fancy maneuvers to make it work. I’m sure there are easier ways to add a lining to this pattern, but when you’re moving to a new country and writing a book and developing a new fabric collection and designing a couple of pattern collections sometimes your brain isn’t as focused as it could be. All in all, it turned out fine. But it wasn’t the easiest construction to figure out, under the circumstances. 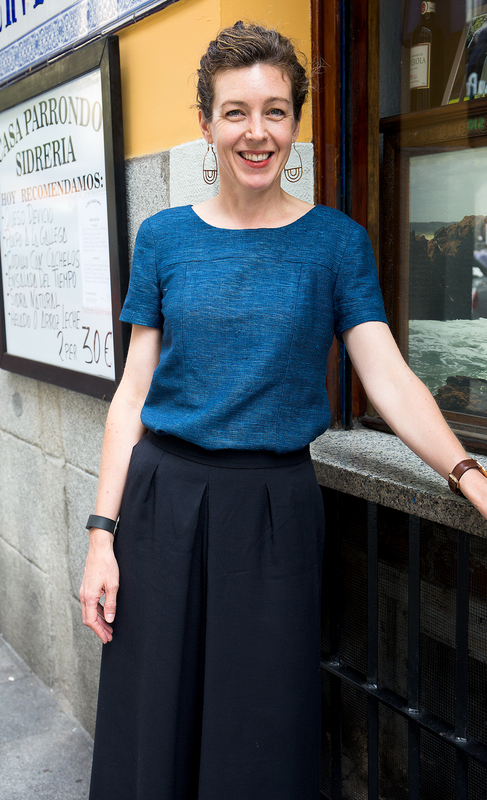 In any case, in these photos I’m wearing the top with my navy wool crepe Liesl + Co Girl Friday Culottes. The top is extremely comfortable and will transition well into fall and even winter, I think. And, of course, next spring I’ll wear it a lot. Obviously I’ll be pairing it with jeans (what don’t I wear with jeans? ), but I’ll also wear it with my B6183 trousers. I mean, if I designed the two pieces to be worn together I should probably wear them together sometimes too. I like that I can wear the top as a casual style as well as a dressy piece. I made sure to choose a really chunky zipper for the back opening of this blouse because it just seemed like the right touch for a somewhat fancy fabric. This zipper was designed for blue jeans and gives the top a little bit of an edge while rescuing it from becoming too precious, I think. By the way, this pattern is sized for cups A, B, and C, so it’s really easy to fit. And the princes seams make it even easier. Have you tried it yet? Because I don’t have Inspector Gadget stretchy arms, I’ve used button-and-loop closures on mine. I’ve only made two; I really should make a few more. It’s a very comfortable top! Great color on you, by the way! Oh, duh, should have added: it translates well into a sleeveless top, too. What I really love about this pattern is that the pattern pieces work really well for custom fitting. I have this pattern and haven’t used it yet – but your top has inspired me! I recognise that background:). how is the settling in going? I lived in Madrid for four years – hated it at first, and grew to love it so I didn’t want to leave. moving countries is hard, and I found the Spanish not to be what I expected – basically, Italians (who I know, as I live in Malta) with a different accent:). Don’t expect them to ask you to their homes – they don’t do that, unlike us and the Italians. I like their down to earth-ness…..
Francesca, you know Casa Parrando? That’s our lunch cafeteria! It’s about 30 steps down the block from home, so I guess you know what our neighborhood is like. We’re settling in well. Every day there’s a struggle with the language (e.g., Liesl ended up with tripe stew at Parrando for lunch the other day when she thought she was getting chicken–totally my fault), but that’s to be expected…. I want to give this a try–would an invisible zipper work without a pattern adjustment? Haven’t done zippers yet so I need some advice before I dive in. Love the top! You looks lovely in it. I really love how your top turned out — put your pattern on the top of my list! Would this top work without a back zipper? Would there be enough room to pull it over your head? Thanks!